Last week, I talked about the dark corner of your Nine-Box, where focusing time and effort on your Icebergs probably represents a waste of time and effort. 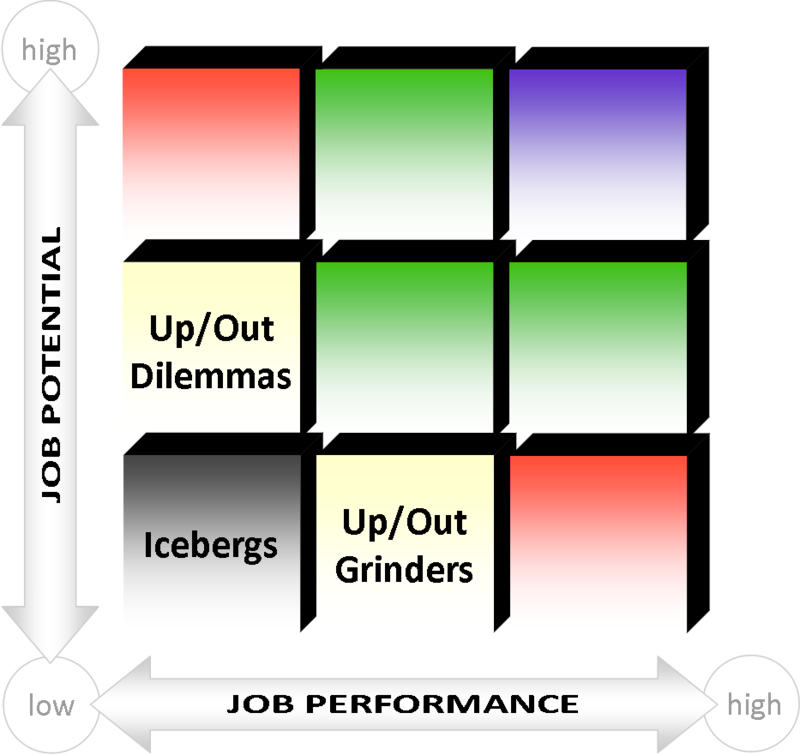 As one moves from the black box Icebergs to the desired purple box of the performance-potential matrix, it becomes increasingly important to invest resources and make the right moves and decisions in developing your talent pool. So with this next category of talent, the focus lies in helping your people upwards (enhancing performance and potential) or outwards (to another role or another organization). These Up or Outs come in two forms and each must be dealt with in slightly different ways. 1. The Grinders in your organization are those who are performing acceptably, but possess limited future potential for growth. Some might suggest leaving your Grinders alone, saying, "They're not exceeding expectations, but it's nice to have people around who are steadily reliable." However, in a fully articulated succession plan, you should endeavor to leave no employee behind. Accordingly, Grinders should be pushed to formulate action plans that improve performance and/or enhance the limited potential they presently display. Put the ball in their court rather than invest development dollars in limited potential people. If, after working their action plan, the Grinder wants to move Up, then you've achieved success with a minimal outlay of resources. If the move is Out, then both employee and employer have laid the foundational groundwork in the action plan for why that is. Perhaps other roles exist in the organization where the Grinder can continue to perform, but do so with more potential for the future. Lastly, the Grinder may come to the realization that being "ok" in a role is not enough for them and will seek more promising opportunities elsewhere. 2. The second form of Up or Outs have some potential to be great in your organization, but for whatever reason, they are not performing. These Dilemmas pose unique challenges for your succession plan. If they are new to the organization, consider reviewing their on-boarding experience. Was something poorly communicated during orientation? Is there a misunderstanding about job expectations? Are there disconnects between recruitment expectations and the realities of the role? New members to an organization often find themselves in this particular box because something has gone wrong. Alternatively, you may have a Dilemma who is rudderless in your organization. Seek out root causes for the performance issues and encourage the employee to develop and own an action plan for remedying deficits. Often, Dilemmas benefit greatly from a peer mentor who can guide them through the predicament they are facing. Ultimately for both types of Dilemmas, assessing fit is key. If addressing performance barriers and action planning do not work to move them Up in the Nine-Box, then moving them Out to a different role or another organization is the only other option. The Up or Outs in your organization form the heavily tactical portions of your Nine-Box; the impact and scope of these decisions tends to be smaller. Actions taken in the lower left three boxes should be focused on employee efforts to change and move up (or out). As you move to the upper right of the Nine-Box, actions become more strategic and far-reaching as the effects of your succession plan begin to have a more direct impact on the goals and success of your organization.